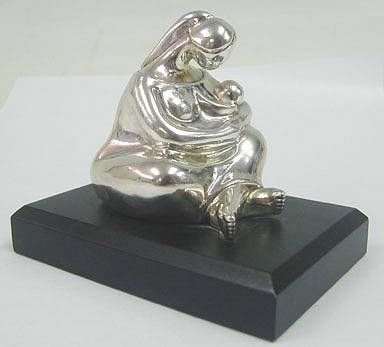 sterling silver mother with baby statuette A beautiful sterling silver mother with baby statuette. 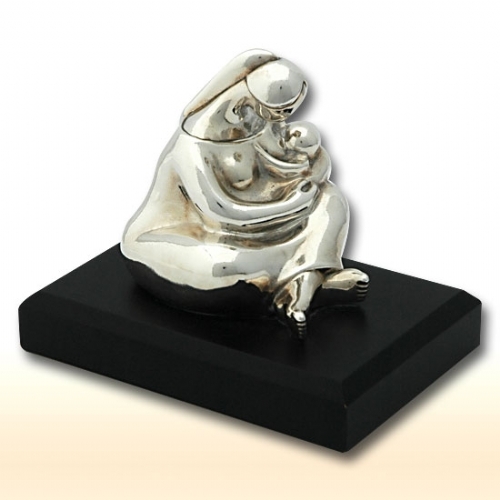 This is a heartwarming statuette of a woman sitting and embracing her newborn baby. It is all carefully crafted with elegant clean curved lines. The statuette is attached to a rectangular black base which creates an interesting color contrast with the silver figure. This statuette was made in the electroforming method. Measurements : Marks : Height: Including base: 3.9in. / 9.906cm. Above base: 3in. / 7.62cm. Base: 3.1in. X 4.8in. / 7.874cm. X 12.19cm. 1 inch = 2.54cm 925 for sterling silver, maker´s mark. Weight : 262.84gr. / 8.451oz.